This recipe of grapefruit meringue tart recipe has been adapted from the book “L’École de la Pâtisserie” by Le Cordon Bleu® institute and publisher Larousse. Other delicious recipes can be found in the book. Combine flour, butter, icing sugar and ground almonds in a bowl. Rub the ingredients between your hands and combine with the tips of your fingers until the mixture resembles crumbs. Add the egg and mix. Tip the mixture onto the work surface, use the heel of the hand to push bits of dough away from you, smearing them across the work surface to form a homogenous texture. Form into a ball, flatten slightly and wrap in plastic film. Refrigerate for 30 minutes. Preheat the oven to 170°C (325°F). Butter the tart ring. Dust the work surface with flour. Roll out the dough to a thickness of 3 mm, to form a circle about 27 cm in diameter (5 cm larger than the mould). Gently roll the dough around the rolling pin, place it over the tart ring and unroll loosely, allowing the excess to hang over the rim. Press the dough gently into the ring to cover the base, inside seam and side. Push the dough towards the center to form a rim. Roll the rolling pin over the rim of the tart ring, pressing down firmly with your hand to remove excess dough. Lift up the folded rim. Place onto a parchment paper lined baking tray. Refrigerate for 10 minutes, blind bake for 20 minutes. Keep the oven temperature at 170°C. In a bowl, whisk the eggs with the sugar. Add the ground almonds and potato starch; whisk well. Fold in the grapefruit juice and melted butter. Pour into the blind baked tart shell and return to the oven for 40 minutes. Cool to room temperature. Remove the peel from a grapefruit and cut into a julienne. Blanch in boiling water, repeat again. Bring to the boil water and sugar for a syrup, add the pomegranate syrup. Add the blanched grapefruit julienne and cook over low heat for approximately 15 minutes. Drain the julienne on absorbent paper towel. Cut a small slice off the top and bottom of the grapefruit. Stand the fruit upright on a work surface and, following the contours of the fruit, use a small paring knife to cut away the peel and all the bitter white pith to expose the flesh. Cut between the membranes to remove the segments. Place the water and sugar into a saucepan and heat the sugar syrup until the temperature registers 119°C on a cooking thermometer. While the syrup is heating, put the egg whites into a metal bowl and beat with an electric beater until foamy. Beating continuously, gradually pour the boiling syrup into the egg whites. Continue beating until the Italian meringue becomes cold and firm peaks form in the whisk. 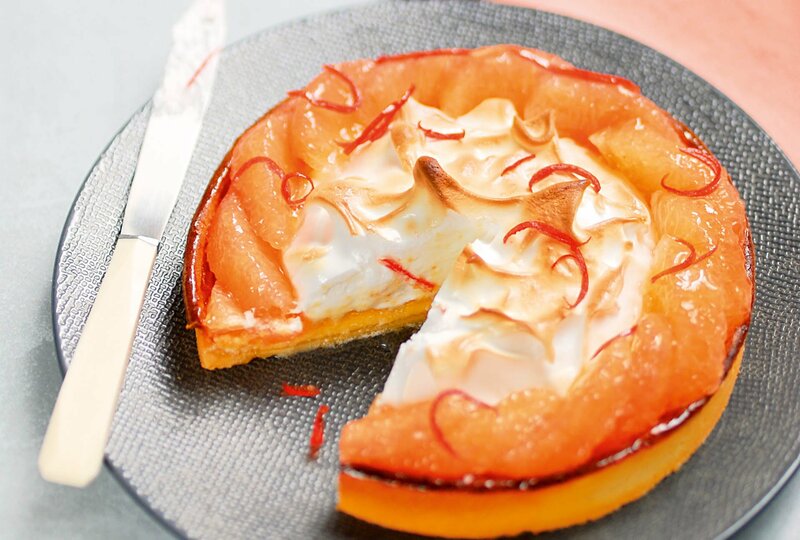 Place the Italian meringue in the centre of the tart on top of the grapefruit filling, taking care to leave a 2 cm space around the edge for the grapefruit segments. Gently tap the meringue with a spatula to form peaks. Quickly brown the meringue under a grill. Position the grapefruit segments around the meringue. Decorate with candied grapefruit julienne.